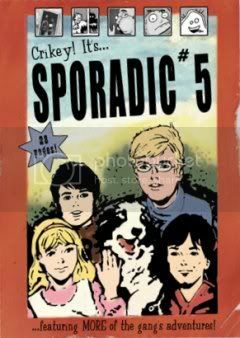 Yesterday my package of Sporadic #5 arrived from Jase Harper. I'm overjoyed to be in this excellent anthology and this issue is just packed to the gills with funny stuff (though definitely not all G-rated). While anthologies aren't about picking favourites I have to mention Rob's usual "Liff" strip, Tonia Walden's wonderful slice-of-life piece (with added zombies), Jase & Kylie's "Moon Fact Page" & "Tokyo Sushi" and Bram Jewsoure's increasingly fascinating "The Sky is Falling," which features some of the finest art I've seen in a local anthology book. 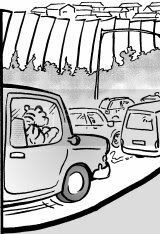 My two contributions are "Head Full of Zombie" and "One Tiger Day." The former I've had around for a while. It was originally conceived as a follow-up to "How to Draw Comics" for OzComics Magazine #4 and submitted in Feb/March 2004, but they dropped their strip content with that issue, and it was looking for a home. Sporadic has turned out to be the perfect place for it, and I've received some good feedback. However, this piece has aged badly, given that it was drawn during the big wave of zombie films, and well before Shaun of the Dead, with which it shares a lot of sensibilities :). Jules Faber's "The Bacterial War of Terror" suffers a bit from the same time delay. I'm happy to be on board with Sporadic and plan to submit more short funny pieces in future. Today I've been helping L. stick beads on a jewel-box kit (a birthday present), and the degree of difficulty was approaching brain surgery at times! I decided to do this to destress from some fiddly drawing I was having problems with (not to mention a few more new character designs I'm trying to get right).